COMMENTS: Another report on M&A’s in the Middle East (seems to exclude North Africa). It indicates that M&A activity surged 62% in the first half of 2018 reaching US$ 25.4 Billion, of which the UAE’s share was 65% (UAE Inbound M&A’s totaled 34 deals valued at US$ 6.6Bill). Outbound, Middle East M&A deals in the first half of 2018 increased 20% to US$ 7.6 Bill over 82 deals, and again, the UAE had the lion’s share at 75%. The bulk of the deals went to the oil & gas and financial sectors and with huge values, e.g. the merger of Saudi banks SABB and Al Awaal at US$ 5 Bill, Emirates Bank’s acquisition of Deniz bank in Turkey at US$ 3.2 Bill, OMG, Austria and TOTAL, France purchase of an Abu Dhabi oil concession field at US$ 2.6 Bill, etc. Some see this as a trend resulting from the new welcoming strategy of the GCC countries to attract foreign direct investments by softening their regulations and procedures. But is this good for the economies of the countries involved? How do these mega M&A deals impact the employment of nationals? How do they increase business activity throughout the economy? How do their benefits filter down to the various sectors and to the smaller operators in the economy? 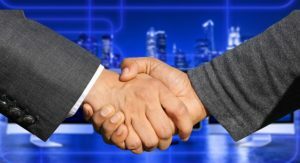 The numbers may need closer analysis and scrutiny to assess if this M&A activity is really beneficial, or merely restructuring or reallocating assets. NEGATIVE FOR: to the countries involved if there is no substantial value added. POSITIVE FOR: the UAE, as it reinforces its reputation as a growing financial center.